Aim: To study the effect of integrated yoga on pain, morning stiffness and anxiety in osteoarthritis of knees. Materials and Methods: Two hundred and fifty participants with OA knees (35-80 years) were randomly assigned to yoga or control group. Both groups had transcutaneous electrical stimulation and ultrasound treatment followed by intervention (40 min) for two weeks with follow up for three months. The integrated yoga consisted of yogic loosening and strengthening practices, asanas, relaxation, pranayama and meditation. The control group had physiotherapy exercises. Assessments were done on 15 th (post 1) and 90 th day (post 2). 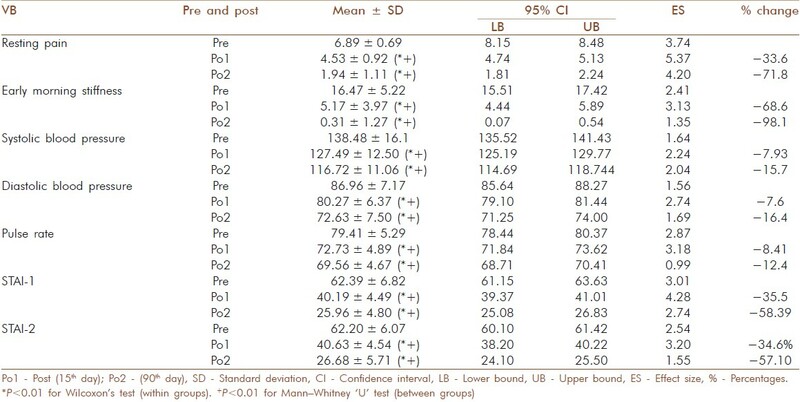 Results: Resting pain (numerical rating scale) reduced better (P<0.001, Mann-Whitney U test) in yoga group (post 1=33.6% and post 2=71.8%) than control group (post 1=13.4% and post 2=37.5%). Morning stiffness decreased more (P<0.001) in yoga (post 1=68.6% and post 2=98.1%) than control group (post 1=38.6% and post 2=71.6%). State anxiety (STAI-1) reduced (P<0.001) by 35.5% (post 1) and 58.4% (post 2) in the yoga group and 15.6% (post 1) and 38.8% (post 2) in the control group; trait anxiety (STAI 2) reduced (P<0.001) better (post 1=34.6% and post 2=57.10%) in yoga than control group (post 1=14.12% and post 2=34.73%). Systolic blood pressure reduced (P<0.001) better in yoga group (post 1=−7.93% and post 2=−15.7%) than the control group (post 1=−1.8% and post 2=−3.8%). Diastolic blood pressure reduced (P<0.001) better in yoga group (post 1=−7.6% and post 2=−16.4%) than the control group (post 1=−2.1% and post 2=−5.0%). Pulse rate reduced (P<0.001) better in yoga group (post 1=−8.41% and post 2=−12.4%) than the control group (post 1=−5.1% and post 2=−7.1%). Conclusion: Integrated approach of yoga therapy is better than physiotherapy exercises as an adjunct to transcutaneous electrical stimulation and ultrasound treatment in reducing pain, morning stiffness, state and trait anxiety, blood pressure and pulse rate in patients with OA knees. Yoga is an ancient Indian science and way of life which talks about the origin of diseases. The texts describe the mechanism of how the suppressed emotions (called adhis) percolate into the physical body manifesting as diseases (adhija vyahdis). These texts go on to describe the conceptual basis for reversibility of mind body disease (prasava-pratiprasava model) and offer the necessary principles to design specific postures, breathing and meditation techniques for different diseases. Hence, yoga is fast advancing as an effective therapeutic tool in physical, psychological and psychosomatic disorders. Yoga therapy has shown significant reduction in pain, functional disability with improved strength, balance and gait, when used as an adjunct in the management of rheumatoid arthritis,  hand OA  and OA knees. , Although we know that the psychological components such as depression and anxiety are important aspects to be addressed in pain management and yoga has shown its contributory role, there are no yoga studies that have looked at the relationship between anxiety and pain in patients with OA knees. Hence the present study was planned. Patients with OA knees from the outpatient department of Ebnezar Orthopedic Center, Bengaluru were recruited for the study. A sample size of 250 was obtained on G power software by fixing the alpha at 0.05 powered at 0.8 and an effect size of 0.38 considering the mean and SD of an earlier study. Two hundred and fifty patients, 76 males and 174 females in the age group of 35 to 80 years (yoga −59.56 ± 9.54) and (control −59.42 ± 10.66) with OA knees(one or both joints) satisfying the ACR Guidelines  for diagnosis were included. The inclusion criteria were (i) persistent pain for three months prior to recruitment, (ii) moderate to severe pain on walking, (iii) Kellegren and Lawrence  radiological grading of II to IV in X-rays taken within six months prior to entry, and (iv) those fully ambulant, literate and willing to participate in the study. Those with (i) grade I changes in X-ray (ii) acute knee pain, (iii) secondary osteoarthritis due to rheumatoid arthritis, gout, septic arthritis, tuberculosis, tumor, trauma or hemophilia were excluded. The study was approved by the institutional review board (IRB) and ethical committee of SVAYSA university. Signed informed consent was obtained from all the participants. This was a prospective randomized parallel active control study on patients with OA knees in the age range of 35 to 80 years. After the initial screening, patients who fulfilled the entry criteria were assigned to either yoga or control group. A computer generated random number table (www.randomizer.org) was used for randomization. Numbered envelopes were used to conceal the sequence until the intervention was assigned. Both groups were given the conventional physiotherapy using transcutaneous electrical stimulation and ultrasound followed by supervised practices at the center for 40 min daily (6 days/week) for two weeks. The study group was taught integrated yoga and the control group the non-yogic physiotherapy exercises by certified therapists. After this, they were asked to practice only the supervised practices of 40 min daily at home for the next three months. Compliance was supervised by telephone calls once in three days and a weekly review class at the center. All patients were asked to tick the practices daily after the home practice in the diary provided for the purpose; at every visit their clinical progress and therapy received on the day were documented. All assessments were carried out on 1 st , 15 th and 90 th days. As this was an interventional study, double blinding was not possible. The answer sheets of the questionnaires were coded and analyzed only after the study was completed. The statistician who did the randomization and data analysis and the researcher who carried out the assessments were blinded to the treatment status of the subjects. The daily routine practiced at the center in the yoga group included 40 min of integrated yoga therapy practice after 20 min of physiotherapy with transcutaneous electrical stimulation and ultrasound for 15 days. The integrated yoga therapy practice included shithilikarana vyayamas (loosening practices), sakti vikasaka (strengthening practices) followed by yogasanas and relaxation techniques with devotional songs. Later patient was advised to continue the integrated yoga therapy practice of 40 min at home for the next three months. Yogic sukshma vyayamas (loosening and strengthening practices): These are safe rhythmic repetitive stretching movements synchronized with breathing. These practices mobilize the joints and strengthen the periarticular muscles. Relaxation techniques : Three types of guided relaxation techniques were interspersed between the physical practices of sukshmavyayamas and asanas. Asanas (physical postures) : Asanas are featured by effortless maintenance in the final posture by internal awareness. We selected asanas in standing and supine position that would relax and strengthen the knee joints. Lectures and Counseling : Yogic concepts of health and disease, yama, niyama, bhakti yoga, Jnana yoga and karma yoga were presented in the theory classes. These sessions were aimed at understanding the need for life style change, weight management and prevent early aging by yogic self management of psychosocial stresses. The daily routine practiced at the center in the control group included 40 min of a therapeutic exercise practice after 20 min of physiotherapy with transcutaneous electrical stimulation and ultrasound for 15 days. The therapeutic physical exercises (40 min) included loosening and strengthening practices for the hands, elbows, arms and shoulders followed by a brief period of rest and specific knee practices followed by supine rest with light music. Later patient was advised to continue the therapeutic exercise practice of 40 min at home for the next three months [Table 2]. Numerical pain rating scale (NRS): Pain at rest was recorded by the patient on numerical pain rating scale prepared for the purpose by drawing a 10 cm line in the center of a white sheet with '0' as nil pain and '10' as worst possible pain. ,, Separate sheets were used at each assessment time. Early morning stiffness in minutes as reported by the patients during clinical interview was documented. State and trait anxiety inventory (STAI-1 and STAI-2): STAI developed by Spielberger et al.,  consisting of 2 forms each comprising of 20 items rated on a four point scale (0-3) was used for assessing the anxiety levels. Form STAI-1 assesses the state anxiety which is defined as 'a transitory emotional state that varies in intensity, fluctuates over time and characterized by feelings of tension and apprehension and by heightened activity of the autonomic nervous system'. It evaluates how respondents feel 'right now' at this moment. Form STAI-2 evaluates trait anxiety, which is defined as 'a relatively stable individual predisposition to respond to situations perceived as threatening'. It assesses how the respondents feel most of the time. The scores for each of the forms range from 20 to 80, with high scores indicating presence of high levels of anxiety. We used both Y1 and Y2 in our study. Quek et al .,  have reported a high degree of internal consistency for STAI with Cronbach's alpha of 0.38 to 0.89 for each of the 40 items and 0.86 for the total scores. test-retest correlation coefficients for the 40 items score were highly significant. Intra-class correlation coefficient was also high (ICC=0.39 to 0.89). Blood pressure (BP): BP was measured using a mercury sphygmomanometer (Diamond Company) on day one, 15 th day and on 90 th day. Pulse rate (PR) - Pulse rate was counted manually for 1 min on first, 15 th day and on 90 th days. It was ensured that the BP and pulse were recorded after completing the intervention in both groups at all points of time. The data were analyzed using SPSS Version 16. The base line values of the two groups were checked for normal distribution by using Shapiro-Wilk's test. The baseline values were not normally distributed. Hence Wilcoxon's signed ranks test and Mann -Whitney U test were used to compare means within and between the two groups respectively. Spearman's Rho test was used to observe the correlations between all variables at all three points in time (pre, 15 th and 90 th days). [Figure 1] shows the trial profile. 7 patients dropped out in the yoga group and 8 in the control group. [Table 3] denotes the demographic data. There was no significant difference between groups at baseline on all variables (P>0.05, Mann-Whitney test for pre values). 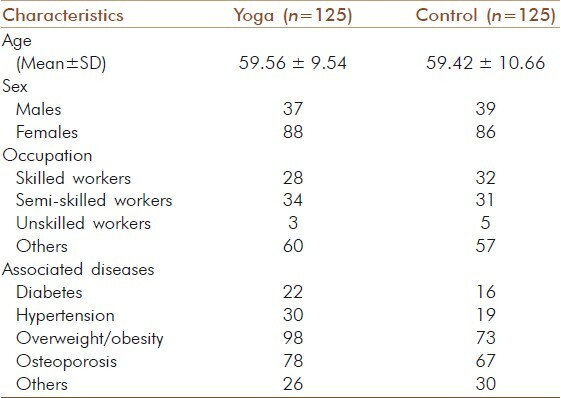 [Table 4] shows the results within yoga group and between the groups. [Table 5] shows the results within control group and between the groups after 15 th and 90 th days. 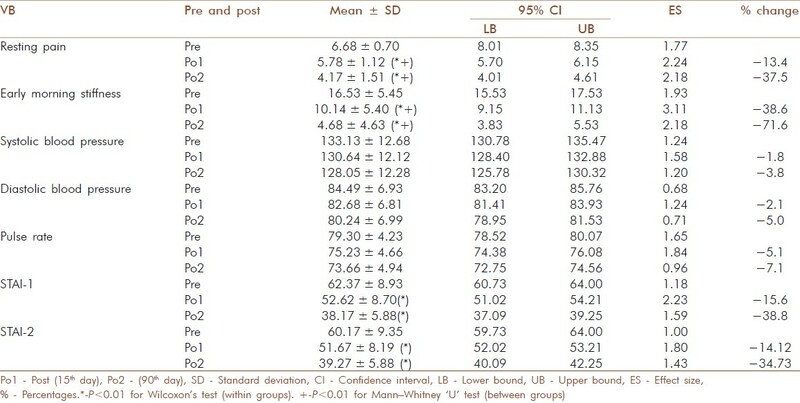 Mann-Whitney U test showed a significant difference between and within groups in resting NRS (Wilcoxon's, P<0.001) after the intervention on 15 th and 90 th day with higher effect sizes in yoga than control group. There was a significant difference in early morning stiffness within groups (Wilcoxon's, P<0.001) and between groups (Mann-Whitney, P<0.001) after the intervention at both points in time with higher effect sizes in yoga than control group . There was better reduction in both state and trait anxiety scores (Wilcoxon's, P<0.001) and between groups (Mann-Whitney, P<0.001) in the yoga group with significant differences within and between yoga and control groups at two weeks and three months. There was significant difference within (Wilcoxon's, P<0.001) and between groups (Mann-Whitney, P<0.001) in the systolic and diastolic blood pressure in the two groups with better reduction in yoga group. There was significant reduction in both groups with (Wilcoxon's, P<0.001) and between groups (Mann-Whitney, P<0.001) significantly better reduction in yoga than control group at 15 th and 90 th days. There was a significant positive correlation (Spearman's Rho test) between early morning stiffness and pain at 2 weeks (P<0.001, r=0.35). Pulse rate also showed positive correlation with pain (P=0.05, r=0.18) at 2 weeks. State anxiety (STAI-1) was positively correlated with pain (P<0.001, r=0.34) at 90 th day; Trait anxiety also showed a positive correlation with pain (P=−0.013. r=0.23) at 90 days. This randomized two armed parallel control trial on 250 patients with osteoarthritis of knees of both genders (F=175) in the age range of 35 to 80 years showed significantly better improvement in yoga than control group on all variables (P<0.001, Mann-Whitney) including resting pain, early morning stiffness, state and trait anxiety scores, blood pressure and pulse rate. In a pilot study on OA of knees, Kolasinski et al.,  used a specific sequence of asanas based on the teachings of Iyengar for eight weeks. They measured only the pain and physical functions by WOMAC with a significant reduction (P=0.04) in pain by 46.7%. 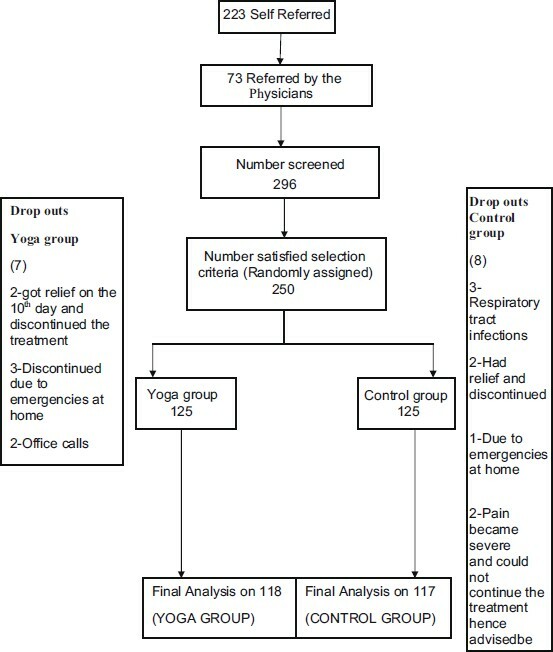 In another pilot study on yoga for OA knees, Ranjita et al.,  used a set of integrated yoga therapy program in a non-residential camp set up for one week without any physiotherapy intervention. She showed a 40% reduction in resting pain after yoga. In our study, we added yoga after the standard physiotherapy which showed a reduction in resting pain scores by 33.6 and 71.8% after 15 and 90 days respectively. Looking at the degree of changes in all the three yoga studies which is similar (37-47%), we may speculate that yoga is beneficial when used with or without a session of physiotherapy. Haslock et al.,  showed the beneficial effects of specific integrated yoga practices in patients with rheumatoid arthritis who had secondary OA in several joints. They observed better increase in hand grip strength (63%, left, 66% right) in yoga group than non yoga controls (8% left and 5% right) indicating reduced stiffness. Our study showed a reduction in early morning stiffness scores by 69 and 98% after 15 and 90 days respectively. None of the other yoga studies have noted morning stiffness as an outcome variable. There was better reduction in state and trait anxiety scores in the yoga group with significant differences within and between yoga and control groups at two weeks and three months. In our earlier study on patients with chronic neck pain,  we had observed significant 19.3% reduction in STAI-1 scores as compared to 8.2% in control group within 10 days of intervention. In the present study, we used both state and trait anxiety measures since this was a long-term follow up of three months. The reduction in anxiety scores after yoga in both STAI-1 (36% -post 1 and 58% -post 2) and STAI-2 scores (post 1-35% and post 2-57%) were much higher in these patients with chronic knee pain as compared to those with neck pain. In a randomized controlled study in patients with chronic neck pain, we observed a reduction in both systolic and diastolic blood pressure by 16% after ten days' of add -on IAYT for neck pain. In the present study also, we observed similar reduction of 16% in both systolic and diastolic BP after 90 days of intervention. The pulse rate reduced by 10% in the chronic neck pain study which is similar to the present study with 12.4% reduction after 90 days of IAYT for knee pain. A significant correlation observed in this study between pain and early morning stiffness after yoga points to the global improvement in the patient's condition. Again, a significant correlation between pulse rate and anxiety with pain shows the mind body interaction. We know that there exists an etiological relationship between an aging disease such as OA and life style, obesity and stress. Whether this positive correlation has an etiologically predictable relationship needs to be studied in future studies. There are some studies that have looked at anxiety and autonomic variables in normal healthy volunteers after yoga for promotion of positive heath. Raghuraj et al.,  observed significant reduction in heart rate variability and blood pressure immediately after 20 min practice of alternate nostril breathing (nadishuddhi pranayama). The experience of pain in OA patients is not only due to activation of sensory nociceptive fibers in the arthritic joint but it is compounded by other factors such as affective, behavioral and cognitive factors. Stress reducing effect of yoga seems to be a major mechanism of its efficacy in pain management in patients with OA knees. The multi-factorial approach of yoga includes not only physical practices (asanas) but also has the components of breathing (pranayama), meditation (dharana and dhyana), introspective intellectual (jnana yoga) and emotional (bhakti yoga) practices. These practices help in bringing about mastery over the modifications of the mind (chittavritti nirodhah) which is the definition of yoga according to Patanjali. This may contribute to a consistent change in behavior and life style that can reduce anxiety and the resultant effect on pain reduction. Baser et al. have shown the association between cognitive behavioral therapy (CBT) with physical, psychological and social well being. The concepts in philosophy of yoga are similar to those of CBT which says that chronic pain is not simply a neurophysiologic state but is influenced by the way a person sees the world and attributes meaning to the events. Lip chick et al.,  showed that the increased sense of personal control over pain following a pain management program of CBT was accompanied by a reduction in negativity. Thus the present study gives evidence to the relationship between reduction in pain, anxiety and sympathetic tone after yoga in patients with OA knees. This may offer preliminary evidence to the reversibility theory of yoga in a degenerative disease. Good sample size, randomized control design, active supervised intervention for the control group for the same duration as the experimental group and follow up for three months with good compliance (6% dropout) are the strengths of this study. The result of this study that has shown marked differences between groups on all variables offers strong evidence for incorporating this module of IAYT for OA knees by the clinicians. The study was on a selected group who presented to a specialty orthopedic center and hence not generalizable. A longer follow up of ≥12 months is necessary to check the long-term efficacy and acceptability. Studies using MRI and biochemical variables may throw light on the mechanisms. Adjunctive program of integrated approach of yoga therapy for OA knees reduces 'rest pain', early morning stiffness, anxiety, and blood pressure and pulse rate. Yoga offers a good value addition as a non-pharmacological intervention in management of OA knees. We are thankful to Dr. Ravi Kulkarni for his help in statistical analysis. We thank Mr. Zafar, the physiotherapist, and also Mrs. Pragati Oswal and Mr. Rangaji, the Yoga therapists, for their enthusiastic participation in the study. We gratefully acknowledge the help of all the staff of SVYASA and Parimala Health Care Services for their co-operation in conducting and funding this study . 1. Felson DT, Lawrence RC, Dieppe PA. Osteoarthritis: New insights. Part 1: The disease and its risk factors. Ann Intern Med 2000;133:635-64. 2. Woolf AD, Pfleger B. Burden of major musculoskeletal conditions. Bull World Health Organ 2003;81:646-56. 3. Chopra A, Patil J, Bilampelly V. Prevalence of rheumatic disease in rural population in Western India: A WHO-ILAR-COPCORD study. J Assoc Physicians India 2001;49:240-6. 4. Altman RD, Hochberg MC, Moskowitz RW. Recommendations for the medical management of osteoarthritis of the hip and knee: New OA practice management guidelines from the ACR. Arthritis Rheum 2000;43:1905-15. 5. Beals CA, Lampman RM, Banwell BF. Measurement of exercise tolerance in patients with rheumatoid arthritis and osteoarthritis. J Rheumatol 1985;12:458-61. 6. Spector T, MacGregor AJ. Risk factors for osteoarthritis. J Osteoarthritis Cartilage 2004;12:39-44. 7. Mahajan A, Verma S, Tandon V. Osteoarthritis. J Assoc Physicians India 2005;53:634-5. 8. Chrousos GP, Gold PW. The concepts of stress and stress system disorders. JAMA 1992;267:1244-52. 9. Aaum P, Leino I, Magni G. Depressive and distress symptoms as predictors of low back pain, neck- shoulder pain and other musculoskeletal morbidity: A 10-year follow up of metal industry employees. Pain 1993;53:89-94. 10. Linton SJ. The prevalence and health- economic consequences of neck and back pain in the general population. Eur J Pain 2000;4:347-54. 11. Pendleton A, Arden N, Dougados M. EULAR recommendations for the management of osteoarthritis: Report of task force standing committee for International Clinical Studies including Therapeutic Trials (ESCISIT). Ann Rheum Dis 2000;59:936-44. 12. Singh G. Recent considerations in non-steroidal anti-inflammatory drug gastropathy. Am J Med 1998; 105. 13. Griffin MR. Epidemiology of non-steroidal anti-inflammatory drug associated gastrointestinal injury. Am J Med 1998;104:23S-9S. 14. Forman JP, Stampfer MJ, Curhan GC. Non-narcotic analgesic dose and risk of hypertension in US women. Hypertension 2005;46:500-7. 15. Ray WA, Stein CM, Daugherty JR, Hall K, Arbogast PG, Griffin MR. COX-2 selective non-steroidal anti-inflammatory drugs and risk of serious coronary heart disease. Lancet 2002;360:1071-3. 16. Garella S, Matarese RA. Renal effects of prostaglandins and clinical adverse effects of nonsteroidal anti-inflammatory agents. Medicine (Baltimore) 1984;63:165-81. 17. Burton DG, Allen MC, Bird JL, Faragher RG. Bridging the gap: Ageing, pharmacokinetics and pharmacodynamics. J Pharm Pharmacol 2005;57:671-9. 18. Luskin FM, Newell KA, Griffith M. A review of mind/body therapies in the treatment of musculoskeletal disorders with implications for the elderly. Altern Ther Health Med 2000;6:46-56. 19. Taimini IK. The science of yoga. Madras: The Theosophical Publishing House;1961. p.7. 20. Nagarathna R. Yoga Health and disease. Kaohsiung J Med Sci 1999;2:96-104. 21. Vempathi RP, Telles S. Yoga based guided relaxation reduces sympathetic activity in subjects based on baseline levels. Psychol Rep 2002;90:487-94. 22. Bonadonna R. Meditation's Impact on Chronic Illness. Holist Nurs Pract 2003;17:309-19. 23. Datey KK, Deshmukh SN, Dahi CP, Vinekar SL. "Shavasan" Yogic exercise in the management of hypertension. Angiology 1969;20:325-33. 25. Yogitha B, Nagarathna R, John E, Nagendra H. Complimentary effect of yogic sound resonance relaxation technique in patients with common neck pain. Int J Yoga 2010;3:19-25. 26. Haslock I, Monro R, Nagarathna R. Measuring the effect of yoga in rheumatoid arthritis. Br J Rheumatol 1994;33:788. 27. Garfinkel MS, Schumacher R, Husain A. Evaluation of a yoga based regimen for treatment of osteoarthritis of the hands. J Rheumatol 1994;21:2341-3. 28. Kolasinski SL, Garfinkel M, Tsai AG. Iyengar Yoga for treating symptoms of osteoarthritis of the knees: A pilot study. J Altern Complement Med 2005;11:689-93. 29. Bukowski EL, Conway A, Glentz LA. The effect of Iyengar yoga and strengthening exercises for people living with osteoarthritis of the knee: A case series. Int Q Community Health Educ 2006;26:287-305. 30. Bookman AA, Williams KS, Shainhouse JZ. Effect of topical diclofenac solution for relieving symptoms of primary osteoarthritis of the knee: A randomized controlled trial. CMAJ 2004;171:333-8. 31. Altman R, Asch E, Bloch D, Bole G, Borenstein D, Brandt K, et al. Development of criteria for the classification and reporting of osteoarthritis. Classification of the osteoarthritis of the knee. Arthritis Rheum 1986;29:1039-49. 32. Kellgren JH, Lawrence JS. Radiological assessment of osteo-arthrosis. Ann Rheum Dis 1957;16:494-502. 33. Nagarathna R, Nagendra HR. Yoga for promotion of positive health. Bangalore: Swami Vivekananda Yoga Prakashana; 2000. 34. Nagarathna R, Nagendra HR. Yoga for arthritis. Bangalore: Swami Vivekananda Yoga Prakashana; 2001. 35. Telles S, Nagarathna R, Nagendra HR. Breathing through a particular nostril can alter metabolism and autonomic activities. Indian J Physiol Pharmacol 1994;38:133-7. 36. Telles S, Nagarathna R, Nagendra HR. Autonomic changes during Om meditation. Indian J Physiol Pharmacol 1995;39:418-20. 37. Pollard CA. Preliminary validity study of the pain disability index. Percept Mot Skills 1984;59:974. 39. Tait RC, Chibnall JT, Krause S. The pain disability index: Psychometric properties. Pain 1990;40:171-82. 40. Spielberger CD, Reheiser EC, Ritterband LM, Sydeman SJ, Unger KK. Assessment of Emotional States and Personality Traits: Measuring Psychological Vital Signs. In: Butcher JN. (Editor) Clinical Personality Assessment: Practical Approaches. New York: Oxford University Press;1995. 41. Quek KF, Low WY, Razack AH, Loh CS, Chua CB. Reliability and validity of the Spielberger State-trait anxiety inventory (STAI) among urological patients: A Malaysian study. 59:258-67. 42. Ranjitha R, Nagarathna R. Effect of yoga on pain , mobility, gait and balance in patients with osteoarthritis of the knee. Bangalore: Dissertation submitted to Swami Vivekananda Yoga Anusandhana Samastana (SVYASA); 2006. 43. Bijlsma JW. Analgesia and the patient with osteoarthritis. Am J Ther 2002;9:189-97. 44. Raghuraj P, Ramakrishnan AG, Nagendra HR. Effect of two selected yogic breathing techniques on heart rate variability. Indian J Physiol Pharmacol 1998;42:467-72. 45. Telles S, Desiraju T. Heart rate and respiratory changes accompanying yogic conditions of single thought and thoughtless states. Indian J Physiol Pharmacol 1992;36:293-4. 46. Perlman AI, Sabina A, Williams AL. Massage therapy for osteoarthritis of the knee: A randomized controlled trial. Arch Intern Med 2006;166:2533-8. 47. Baser HD, Jakie C, Kroner-Herwig B. Incorporation of cognitive-behavior treatment into the medical care of chronic low back pain patients: A controlled randomized study in German pain treatment centers. Patient Educ Couns 1997;31:113-24. 48. Lipchik GL, Milles K, Covington EC. The effects of multidisciplinary pain management treatment on locus of control and pain beliefs in chronic non-terminal pain. Clin J Pain 1993;9:49-57.